What is Contra Dancing? Find Out at The Cooperage! When you travel, you try and plan things to do not only during the day but also in the evening and night time. This can be anything from going out to eat to visiting local bars and night clubs. There are some of us out there that like to go out at night but don’t like a crowded, loud scene. If you are one of those people, you might be thinking, then what can I do to have a good time at night in the Pocono Mountains? Let us at Ledges Hotel help steer you in the right direction and suggest heading over to The Cooperage in Honesdale for a night of contra dancing. You might be asking yourself, what is contra dancing? Let us explain to you what this type of dancing is and why it would be a great idea while you are here. 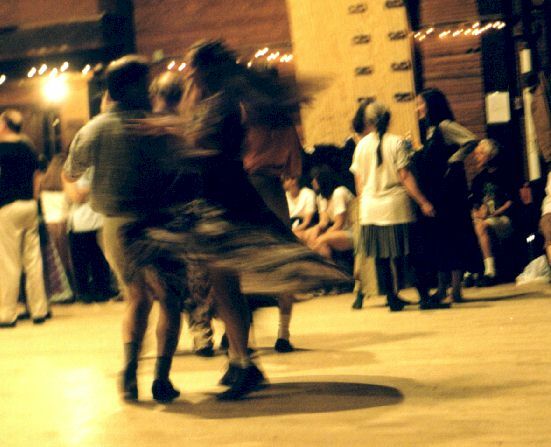 Contra dancing has its roots all the way back to the 17th century in Europe where the English and then the French enjoyed dancing together in halls. Contra dancing came across the ocean with the English settlers. Contra dancing has been a very popular type of dancing and also was the origin for the term country dances. While you may typically think about country dancing where people dress up in Western outfits, dance in circles, and have a partner, contra dancing is similar but a lot more fun. When you go to a contra dancing event, one thing to know is that you can be a beginner as well as not have a partner. Most events have a little of instruction for the beginners before they get started. This is also a family-friendly event so there is typically no alcohol served as well. As for the dress code, come as you are and just wear something comfortable. One of the reasons why contra dancing has become so popular lately is that it is a great form of exercise as well as meeting people. In contra dancing, you not only interact with your partner but with just about everyone else too as the dance moves on. Contra dancing is formed with two lines of couples and is led by a caller who calls out the types of moves that you will be doing. All of this is set to live music so as you can see, it can be a lot of fun. Now that you have answered the question, what is contra dancing, let’s have a look at where in the Pocono Mountains you can go contra dancing. In nearby Honesdale is The Cooperage, an amazing location that is always hopping with something to do. Their main premise is to have a place where the community can come together. The founders of The Cooperage believe that community is one of the most important things and that we all benefit from having a relationship with our community. This is why they hold fun classes, events, concerts, contra dancing, and more. They only host contra dancing events a few times a year so be sure to plan to come to one of their contra dancing events when you can. The next contra dancing event at The Cooperage will be on November 28th from 7:30 pm to 10 pm and the last for the year will be on December 19th. As you can see, we love to have a good time here in the Pocono Mountains during the day or even at night. We hope that you will plan a trip to come to the mountains soon. When you do, consider staying with us at Ledges Hotel. Our beautifully restored hotel is modern with a touch of history too. We have room sizes from our smaller economical rooms to our larger 2 bedroom suites perfect for groups. Contact us today and let us help you plan a fun trip to the Pocono Mountains. Want to learn more about our area? Request your free Vacation Guide today! Spend a Perfect Date Night at Glass Wine Bar — Where are the Pocono Mountains?